Missed It By This Much! 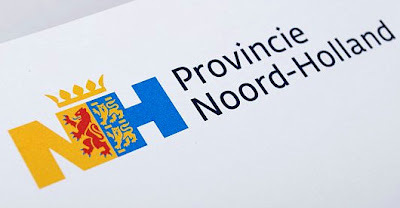 The Eden Spiekermann group, which redesigned The Economist in 2001, recently developed the logo below for the Netherlands province of North Holland. The conjoined legs of the ‘N’ and ‘H’ integrate the province’s coat of arms. To expand on the arms Or a lion Gules tongued and clawed Azure are the arms of the earldom Holland, Azure two lions passant guardant between 5 horizontal billets Or are the arms of the region of West-Friesland.